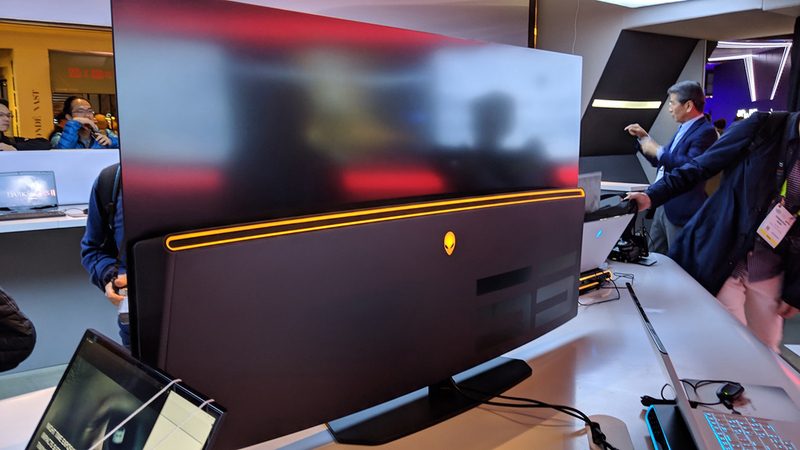 In a surprising move Dell demonstrated a prototype of its Alienware 55 OLED display for gamers at CES. 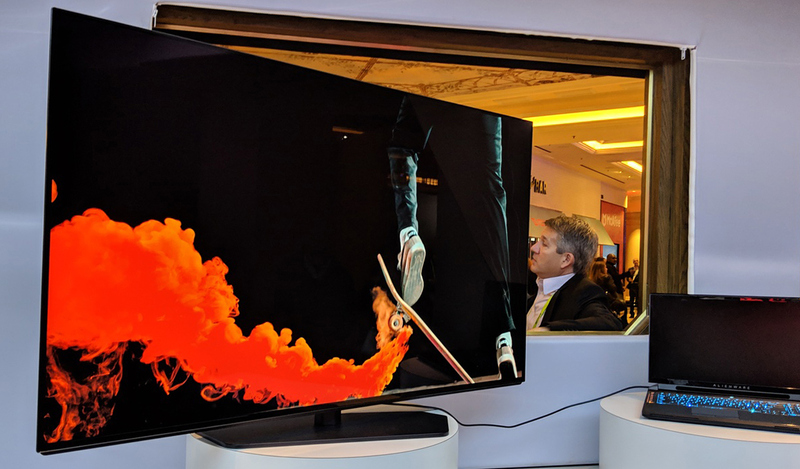 The 55-inch OLED monitor features a 0 Hz adaptive refresh rate and because of high contrasts that the OLED technology provides, the display promises to be one of the most impressive displays released this year. In the meantime, it is still in development and its price will likely be well beyond reach of most gamers. The Alienware 55 display relies on an Ultra-HD (3840×2160) OLED panel that boasts with vivid colors, deep inky blacks, an extremely high contrast ratio (~100,000:1), fast response time (~0.1 ms), wide horizontal viewing angles, and an up to 0 Hz adaptive refresh rate (which is what sets the monitor apart from OLED UHDTVs). The display can reproduce up to 95% of the DCI-P3 color space, which is oddly low for an OLED monitor, but which is explainable as the device is still in development. In fact, while Dell says that the Alienware 55 display is set to support an adaptive refresh rate technology, the manufacturer does not disclose whether it will eventually support AMD’s FreeSync/FreeSync 2 or NVIDIA’s G-Sync/G-Sync HDR when it is finalized. As for connectivity, the monitor features DisplayPort 1.4 and HDMI 2.1 (with the latter possibly pointing not only to a new cable requirement, but also to variable refresh rate (VRR) and other HDMI 2.1 features support). It is noteworthy that to make design of the Alienware 55 attractive for gamers (if a 4K 0 Hz OLED panel is not enough), the monitor has programmable RGB lighting on the back. Dell currently expects to start sales of its Alienware 55 gaming OLED monitor sometimes in the second half of the year. Pricing of the device is currently unknown, yet one can guess that because it uses a 55-inch Ultra-HD OLED panel with a 0 Hz refresh rate, this is going to be an ultra-premium product competing against NVIDIA’s BFGD (Big Format Gaming Display) LCDs. 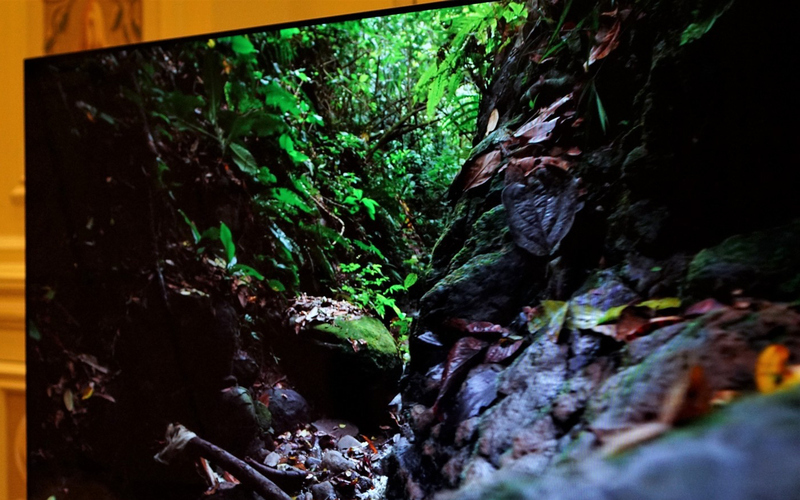 What is notable is that Dell no longer sells its UltraSharp UP3017Q OLED monitor, so the company might be reviewing its OLED offerings in general and the 55-inch panel could be used not only for the company’s gaming solution.